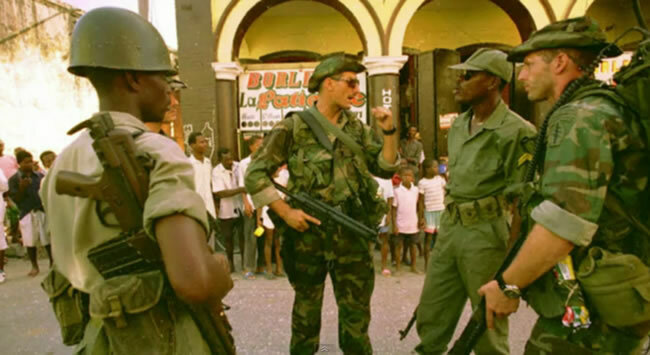 On December 2011, President Martelly took some steps to rebuild the military forces abolished in 1995. He appointed a special commission who consulted international and domestic experts to develop a blueprint. On May 2012, the committee submitted a detailed report on the requirement of human and financial resources with the creation of a Ministry of Defense. On September 17, 2013, the effort took a shape when Jean-Rodolphe Joazile, the Haitian Defense Minister greeted the first 41 members of the new armed forces (all fresh high school graduates) on their return from 8 months training in Ecuador. After their comeback, they worked on road construction and other public service projects in central Haiti with the Ecuadoran military engineers for three months. Thirty of them were soldiers, ten engineers and one officer; they were accountable to the Ministry of Defense but not authorized to carry any gun or weapon immediately for the next three to four years until they are permitted to carry such either on government finance or from own resources. President Martelly has an initial plan to build a primary force of 3,500 soldiers who will patrol the border and operate during the time of crisis. This will create many job opportunities for the young, as well. His government is considering to build a fund of $95 million to train and equip the new forces so that they can effectively replace 12, 000 U.N. Peacekeepers presently stationed in the country. However, Jocelyn McCalla, a Haiti-born political observer has remarked that the country would be better served by creating a job program. Because an army is the last thing that Haiti needs at this point.